Are you looking for the best kiteboarding spot in Asia then don’t look any further and join Vietnam Kiteboarding School in Mui Ne Vietnam! 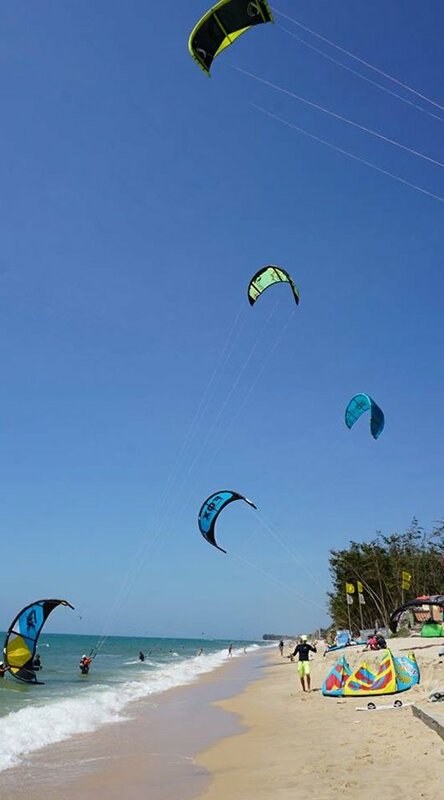 Vietnam kiteboarding School is located in Mui Ne Bay, approximately 200km East of Ho Chi Minh City. It’s beautiful white sands has graced the covers of many kite and wind surfing magazines. Mũi Né is a coastal town in the Bình Thuận province of southeastern Vietnam. Its economy is based primarily on tourism and fishing. Much of the tourism is based on kitesurfing, resort stays, the sand-dunes & other attractions, and of course, the beaches and the seafood. The high season in Mui Ne starts when the rainy season is over and is defined by a good consistent wind. It usually starts from around October until the end of April and the low season is usually between May and September. In the “High season”, the wind is on average between 15 to 30 knots, with some days 40+. With its cross on-shore wind direction and warm water, it is a paradise for beginners and experienced kitesurfers alike. Mui Ne (meaning “sheltered peninsula” in Vietnamese) Beach and the surrounding Binh Thuan province both have a lot to offer travelers. There are beautiful tropical beaches lined with groves of swaying palm trees, immense Saharan-style sand dunes meandering for kilometers in colors of red, yellow and white, tall mountains with bamboo rainforests and pristine waterfalls, and deep red canyons parted by twisting streams.